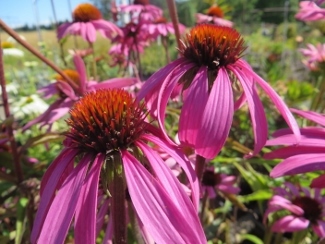 Joy Creek Photo Archive (c) all rights reserved Echinacea purpurea 'Magnus' has extra-large flowers (up to seven inches across) with ray-florets that are more horizontal, less drooping, than other forms. The central cone is dark golden orange. A Great Plant Picks selection.